46-1/4" × 48-11/16" × 2-13/16" (117.5 cm × 123.7 cm × 7.1 cm), frame. 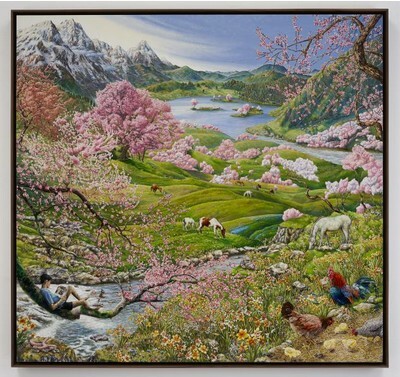 Pace Gallery presents, at 537 West 24th Street, new paintings by Raqib Shaw. The exhibition showcases Raqib Shaw’s first work in the long tradition of landscape painting, signifying a new direction for the London-based Kashmiri artist. Drawing inspiration from his childhood memories of Kashmir and the nature and architecture of the Indian subcontinent, Raqib Shaw has mined and re-envisioned his own personal history through the compulsively-detailed, meticulously-painted, and emotionally-potent works. A full-color catalogue featuring a conversation between the artist and Pace Gallery Founder Arne Glimcher accompanies the exhibition. This exhibition is the culmination of two decades of the artist’s continual refinement and experimentation with Hammerite enamel paint – a dedication that has allowed Raqib Shaw to push the material beyond its traditional capabilities. Shaw has approached this material and his practice with a mentality resonant with the Japanese mindset of Monozukuri. For the latest paintings, Raqib Shaw initially swirled the paint around with matchstick splinters and pieces of wood, then porcupine quills, and finally fine needles attached to quills for the most detailed areas of the compositions. The result is a paint surface that appears both fragile and highly textured, encompassing an extravagant color palette. While grounded in the artist’s personal history in Kashmir, the new works also demonstrate Shaw’s careful study and appreciation of the tradition of Western landscape painting, including the work of masters Pieter Bruegel the Elder, Annibale Carraci, John Constable, Caspar David Friedrich, and Thomas Gainsborough. East meets West in Raqib Shaw’s final works fusing them with pictorial traditions of Persian and Mughal miniature paintings. Although an artist of note, his work should be considered philosophically closer to that of Dubuffet and “outsider artists” than being integral to the concerns of contemporary figuration.